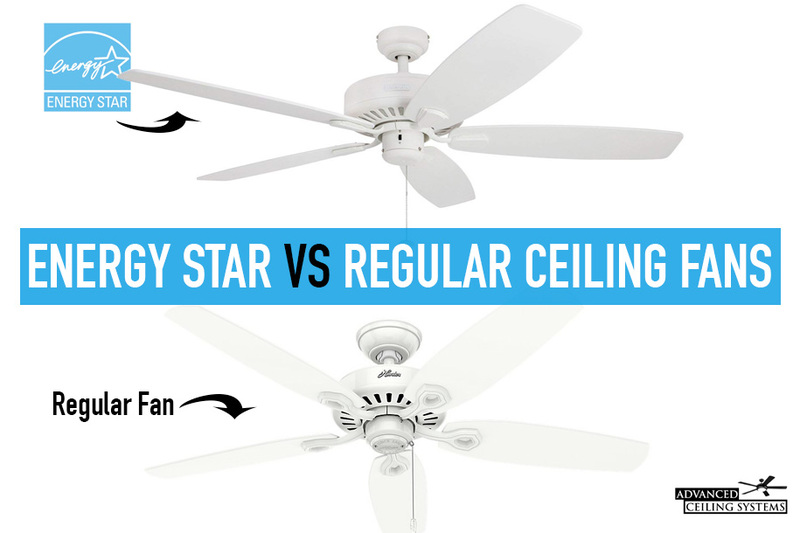 What makes a ceiling fan Energy Star? How is energy efficiency measured in ceiling fans? Are Energy Star ceiling fans worth it? Energy Star is a program that provides certifications to consumer products which meet specific standards of energy efficiency. The standards are set in conjunction with the EPA (Environmental Protection Agency) and DOE (United States Department of Energy). The bulk of Energy Star ceiling fan requirements revolve around efficiency. Requirements vary by the type of ceiling fan and size of ceiling fan. All ceiling fans are tested for specific minimum efficiency and airflow at high speeds. You can read the full requirements on the official Energy Star website and documentation (PDF). Energy Star ceiling fans must have easy-access fan speed and light controls. This includes pull chains, wall-mounted switches, remote controls and mobile apps. The EPA requires that all ceiling fan manufacturers provide energy information to consumers in the form of an Energy Information label which can be found on the side of the retail box. The label consists of three different numbers; Airflow (cfm), Electricity Use (watts), and Airflow Efficiency (cfm/w). These numbers allow us to measure energy efficiency at the ceiling fan's highest settings. It's important to note that all ceiling fans sold in the United States will have a similar energy information label regardless if they have an Energy Star certification. This is good news for anyone who wants to compare Energy Star ceiling fans to regular models. Below is an example of a common Energy Information label and an explanation of each section. Airflow (cfm) - When we talk about airflow we mean the cubic feet per minute or cfm for short. This number measures air movement. The higher the cfm number, the more airflow a ceiling fan is capable of producing. Electricity Use (watts) - With Electricity Use, the amount of electricity a fan uses is measured in watts. This number helps consumers navigate the rate of energy consumption of the ceiling fan. The lower this number, the less electricity a ceiling fan uses. Ideally you will want a ceiling fan with higher airflow and lower electricity use. Airflow Efficiency (cfm/w) - Airflow Efficiency is simply a ratio of cfm to watts and is usually represented as cfm/w (Cubic Feet Per Minute Per Watt). Although a higher cfm/w number is ideal, it isn't always the best measure of energy efficiency. For example, although a ceiling fan can produce a high cfm/w number it can also have weak airflow with less power. A weak fan running on it’s highest setting will not be cheaper to run when compared to a more powerful fan with better air flow that can be run on a lower setting. 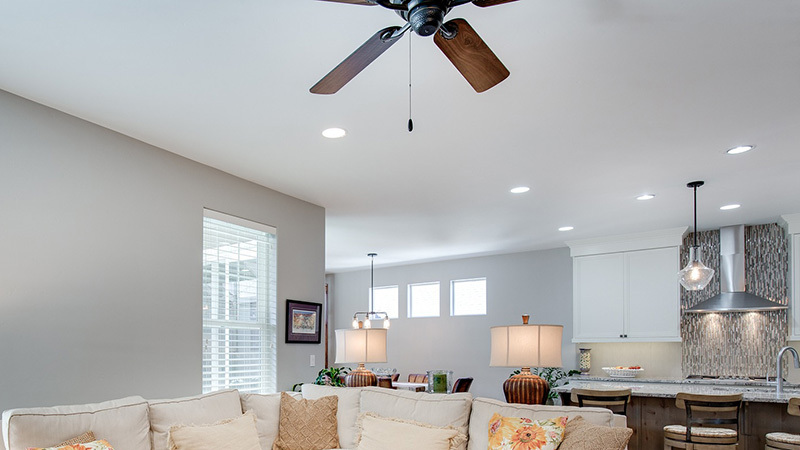 At a quick glance you’ll notice that although there isn’t much difference between the two ceiling fans despite the Honeywell Sutton having the Energy Star certification. Although the Honeywell Sutton has a higher cfm it also has uses more energy at 66.1 watts compared to the Hunter Builder Plus’ 60 watts. Since the specs are so similar in these two fans, it’s safe to say that there will not be much of a difference in yearly energy savings between the two fans. One thing to note is that at the time of this writing the Honeywell Sutton was retailing for $120 while the Hunter Builder Plus retailed at $80. In our opinion, the Energy Star certification isn’t worth the extra cost and while the Honeywell Sutton has better airflow the difference really doesn’t justify the higher price. This is a great example of not taking the Energy Star label at face value. Instead you should take the time to really read the energy efficiency labels of each fan and see for yourself if the Energy Star ceiling fan is really that more efficient than it’s regular ceiling fan competitor. In the chart above we compare two higher end ceiling fan models; the Haiku Home L Series vs the Casablanca Wisp. We find this comparison interesting because the Haiku Home L Series ceiling fan is one of the best energy efficient Energy Star certified ceiling fans on the market today. When compared to the similarly styled Casablanca Wisp, it’s easy to see why the Haiku has it’s Energy Star certification. Unlike the budget models we compared above, there is a serious difference in energy efficiency between these two more expensive ceiling fan models. At 5,604 cfm, the Haiku ceiling fan produces more than 1,500 cfm than Casablanca’s 4,022 cfm. Not only is the Haiku fan more powerful, but it only uses 18.9 watts at it’s highest setting. When compared to the 44 watts used by the Casablanca Wisp it’s easy to tell which fan will produce more energy savings. In this comparison, the Haiku Home L Series ceiling fan is the most energy efficient. So are Energy Star ceiling fans worth it? According to Energy Star, all ceiling fan models must be tested and third-party certified to meet Energy Star standards. As shown with the Honeywell vs Hunter comparison above, ceiling fans can have similar energy specifications with and without the Energy Star label. In some cases a manufacturer could have met Energy Star standards but did not want the added cost of the certification process. Remember, costly testing has to be done before Energy Star certification can be given and this cost is often passed down to the consumer. Because of the extra cost of testing, it’s not uncommon for an Energy Star ceiling fan to cost more than a non-certified fan. This is why comparing energy information is an important part of shopping for a new ceiling fan. Just because a ceiling fan has the Energy Star label, doesn’t mean it’s always worth the extra cost. As discussed above, all Energy Star ceiling fans have specific requirements that must be met before being issued a certification. Some of these features include having a minimum 3 year warranty, energy efficient light kits, and easy access to fan and light controls. Because of these requirements, Energy Star labels are an easy way to determine if a fan has all of the features you want or need at a glance.